Faculty and trainees came together for the Lung Research Center’s annual symposium on Monday, April 3rd to highlight lung research from across the Brigham, including the Channing Division of Network Medicine, the Division of Pulmonary and Critical Care Medicine and the division of Thoracic Surgery. The poster session, featuring 38 research projects from junior faculty and trainees drew a large and enthusiastic crowd. 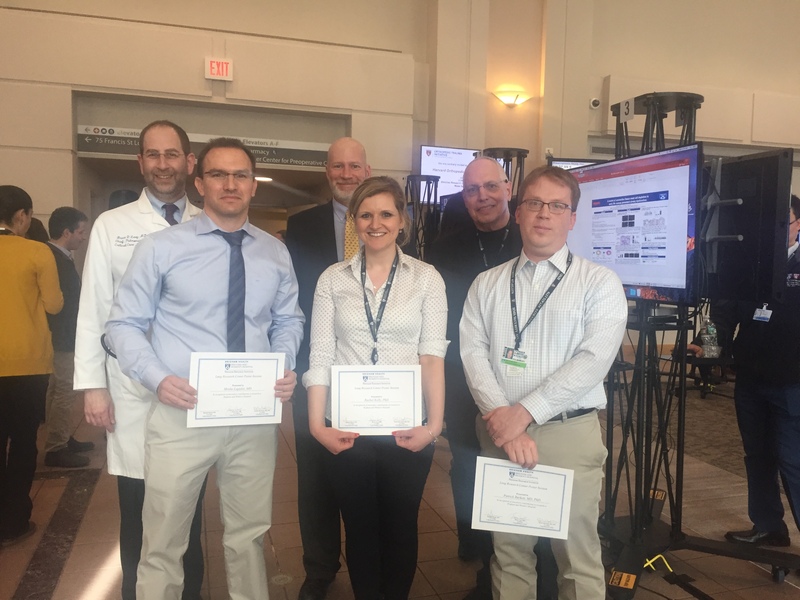 Among all the outstanding work that was presented, three researchers stood out and were awarded with a $1000 cash prize: Patrick Burkett, MD, PhD, Instructor in the Division of Pulmonary and Critical Care Medicine; Rachel Kelly, PhD, Research Fellow in the Channing Division of Network Medicine; and Moshe Lapidot, MD, Research Fellow in Thoracic Surgery.